Photoshop (and the other programs of the Adobe Creative Suite) uses floating palettes. The palettes, many of which you see along the right edge of your screen, always appear on top of (float over) your image window. The image window will never hide your palettes. (Palettes, however, can hide other palettes.) The Options bar (across the top of the work area) and the Toolbox (or toolbar) along the left edge of the screen are also palettes. Figure 3-2: Nesting palettes and using the Palette Well prevents crowding the work area. Shift+Tab to hide all but the Toolbox and the Options bar. 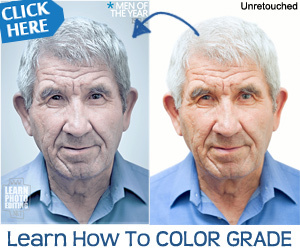 With fewer palettes visible, you provide more room for your image. You can selectively hide and show palettes via the Window menu. As you see in Figure 3-2, several palettes can be nested (grouped together). To bring a palette to the front, click its tab. You can also drag a palette's tab to move it out of a group to any location onscreen or into another group. Also, at the right end of the Options bar is the Palette Well, which contains (by default) the Brushes, Tool Presets, and Layer Comp palettes. Drag a palette's tab into the Palette Well to get it out of your way yet leave it easily accessible. Many of Photoshop's palettes are resizable. Like an image window, you drag the lower-right corner of the palette to expand or contract it. You also have a couple of buttons to control the visibility and size of the palette or palette group. Take a look at Figure 3-3. 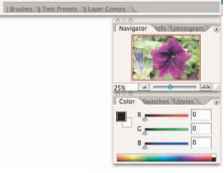 Macintosh users have three buttons in the upper-left corner of the palette, and Windows users have a pair of buttons to the upper right.